There's something so charming about the idea of moving to a small Breton village by the sea and starting a new life, right? If a person could be happy anywhere surely this would be the place. And if a person came to it unhappy with life, sad to her very soul, this would, without a doubt, be the perfect place of healing. 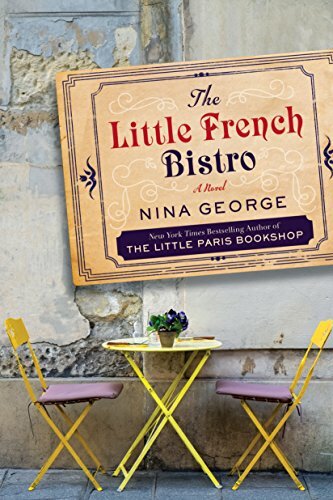 Nina George's newest novel, The Little French Bistro, is set in one such place in Brittany. Marianne Lanz is in her sixties but sounds older because she is tired and beaten down. She's trapped in a loveless marriage with a controlling husband and on a trip to Paris, she decides that she's through with life and determines to commit suicide by jumping off a bridge into the Seine. Rescued by a bystander, she is taken to the hospital where her husband roundly chastises her for her seemingly impetuous and, to him, deeply embarrassing attempt before leaving her there so he can catch the bus back to Germany. She can find her own way home. Instead, inspired by a lovely, small, hand painted tile she finds by the nurses' station, Marianne runs away from the hospital, heading to the Port de Kerdruc depicted on the tile, thinking that it would be a beautiful place to die. Once again she survives her attempt. Fished out of the water by a local fisherman and accepted by the local people despite an initial wariness, she settles in to make her home in this quaint and picturesque town. Kerdruc would be a beautiful place to die but Marianne quickly finds that it's an even more beautiful place to live. This is very much a novel about second chances. Marianne finds the strength to stand up to her bully of a husband, emerging from lifelong oppression and carving out her own life in a new and welcoming place. In this she is inspirational but in presentation, this is more like a fairy tale than real life. And that's fine if that's what you want to read but the story brings up some very dark issues that shouldn't be so easily solved. Marianne is the character whose journey of discovery and starting over is the most obvious but each of the friends she makes in Kerdruc has a problem to solve or a situation to change so that they too can embrace life and reach for love. The secondary characters are all amiable and winsome and their kindness is clearly the most important thing in helping Marianne to heal but sometimes they blur together, not being quite as differentiated as they should be. The story is ultimately simple and life-affirming. Those readers looking for a warm, feel-good novel writ in soft focus will find this delightful and hopeful despite the darker undertones. Thanks to LibraryThing Early Reviewers and the publisher for sending me a copy of this book for review.